Letter of credit is an assurance given by the buyer’s bank to remit the amount to the seller through seller’s bank on maturity, as per the terms and conditions of document based on the contractual agreement between buyer and seller. Now in simple words, If LC opened on your name, you will receive amount though the buyer’s bank on the agreed time. All Letter of Credits for export import trade is handled under the guidelines of Uniform Customs and Practice of Documentary Credit of International Chamber of Commerce (UCP 600). There are various types of letters of credits like Revocable, Irrevocable, Confirmed, Unconfirmed, Clean & Documentary, Fixed, Revolving, Transferable, Back to Back etc. Most common and safe LC is Irrevocable Letter of Credit. I will explain in details about all types of LC in another article. You can also read more information by clicking What are the advantages of Letter of Credit to Exporter? How LC is benefited to Importer? 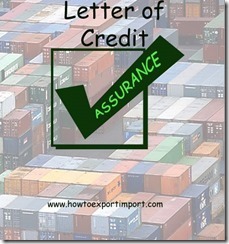 Are there any disadvantages to importer for a consignment under Letter of Credit? What are the disadvantages of LC to an exporter? Who are the parties involved in Letter of Credit? How to check authenticity of LC? What is Prime Banker? Yes, I am sure, once after going through that articles you will have a good knowledge about Letter of Credit. Navigation controls to enroll with GST in India for existing VAT payers in IndiaHow is IGST calculated under Imports? Harigokul: On 29 August 2015 HI sir, you said that there are various types of letters of credits like Revocable, Irrevocable, Confirmed, Unconfirmed, Clean & Documentary, Fixed, Revolving, Transferable, Back to Back etc. could you explain????? inder jeeth : On 20 April 2016 I AM INDERJEETH ,I HAVE A QUESTION I WANT TO INTERMEDIATE BETWEEN THE EXPORTER AND IMPORTER IN SUCH A WAY THAT THEY DONT KNOW EACH OTHER I VE BEEN ADVICED THIS WAY FOR WHICH I HAVE PLANNED TO OPEN AN OFFICE IN DUBAI (OFF SHORE ) 1. THE EXPORTER MAKES THE BL ON THE DUBAI COMPANY 2. AND SURRENDERS THE BL. CAN THIS HAPPEN THE SAME DAY THE EXPORTER RECEIVES THE BL. 3. SENDS THE SURRENDERED BL MESSAGE TO ME 4. I IN TURN SEND IT TO A SHIPPING AGENT TO MAKE A NEW BL IN THE NAME OF THE BUYER 5. NOW CAN THE AGENT SEND THE NEW BL TO MY BANK IN DUBAI DIRECTLY , WITH OUT SENDING IT TO ME 6. HOW MUCH TIME DOES IT TAKE THE AGENT TO MAKE THE NEW BL ( DOES IT HAPPEN IN FEW HOURS OR IT TAKES A DAY.. DOES THE AGENT NEED TO GO TO THE SHIPPING COMPANY S OFFICE OR CAN BE DONE THROUGH THE NET. 7.WILL MY BANKER IN DUBAI( ONLY A CURRENT ACCOUNT ) ALLOW ME TO OPEN AN LC ON THE BASIS OF MY BUYERS LC. amar pote : On 10 August 2016 I am a regular user of your site - How to Export and Import. I want to gain knowledge in the field of Inward Remittance. Can you help me to provide some important notes on Inward Remittance? Ahammed Junais : On 12 August 2016 I want to Study LC documentation of export and import courses, so can you help me. Dots Collection : On 20 November 2016 From Bagladesh. Need Export & Import LC regular Basis. If you can help about LC Please advise terms and condition Urgent basis.Awaiting your valuable reply. baljeet: On 12 June 2017 We are in urgent need of suggestion for below points:- This is regarding LCL shipment India to Saudi Arabia 1. Export L.C opened in SYndicate Bank 2. Material already shipped on 05.05.2017 3. We want to payment in another account of SBI Bank (NOT IN SYNDICATE) 4. AD code registerd at port - syndicate Bank. baljeet : On 15 July 2017 We, JSSI Hydraulics Pvt. Ltd. located at New Delhi and doing export from last 4 Years. We are in urgent need of suggestion for below points:- This is regarding LCL shipment India to Saudi Arabia 1. Export L.C opened in SYndicate Bank 2. Material already shipped on 05.05.2017 3. We want to payment in another account of SBI Bank (NOT IN SYNDICATE) 4. AD code registerd at port - syndicate Bank. Arun: On 21 July 2017 I need your assistance regarding preshipment loan against irrevocable LC. we received the export order from our client . Client also ready to give irrevocable LC but we need some amount to purchase the goods . we are very new to the export and don't have vintage so bank is not ready to give preshipment loan. Bank told we dont have such option like preshipment loan. with LC cant we arrange money for business ? Any procedure please let me know. V.BASKAR: On 03 October 2018 Sir do you arrange any one day training program for export , please do inform. Shilpa: On 31 March 2019 Sir, could you explain various type of letter of credit?